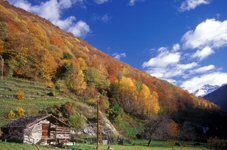 Whoever would like to get to know the nature, villages and art of the wonderful Val Bregaglia must go along the Via Bregaglia. It's an excursion that almost entirely covers forest roads and easy paths, always well signposted and with many rest points. The road starts at the Belvedere Castle of Maloja (14), near many "potholes" ("marmitte dei giganti"). The Malögin route continues on to the Cavril plateau runs briefly along the state road and then reaches the St. Gaudenzio ruins going down to the village of Casaccia (13). Once across the road, the route continues on flat ground within the beautiful fir-woods until the alpine huts of Löbbia. One must then go down a small road, cross the state road to then carry on along the path until arriving at Röivan. From here one enters woodland, skirting twice the state road until arriving at the locality of Pranzaira. Here the path carries on along the road until arriving at the locality of Crotto where it then bends right in the direction of an ancient furnace; one must carry on down a slight slope until crossing an asphalted road which goes up to the camp site and to Roticcio. Another short walk in woodland takes one to the outskirts of Vicosoprano (12) which has a beautiful historical town centre (Palazzo Pretorio). Once crossed the town and the state road, the path continues from near the post office into the woods up to Borgonovo (11) where, as well as the town, one can visit the St. George church with nearby churchyard where the sculptor Alberto Giacometti is buried. 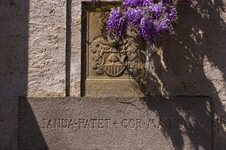 It then goes down to Stampa (10), along the state road (Tourist Office of Val Bregaglia) and reaches the valley museum in the Ciäsa Granda. The path then continues briefly along the main road (on the right is an interesting medieval tomb) up to a deviation in the road which, by crossing the bridge, goes up to Castelmur Palace in Coltura. On the outskirts of the village the path turns left following a small asphalted road which arrives at the village of Caccior. Across the village near the last houses, the Via Bregaglia offers two alternative routes to reach the Italian border. The first follows a dirt road which arrives on to the old state road and which one has to follow up for a brief stretch, going towards left towards the tower and Nossa Donna church and the path which reaches Promotogno (8). From here one must follow the small road which goes to Bondo (7), passing the charming zone of the "crotti" (natural cavities in the rocks used to place wine and salami for maturing). Once having crossed the pretty village, one must continue in the direction of Castasegna along a wide dirt road which goes up for a short stretch in woodland above the alpine huts of Casnac (with a panoramic view of the Italian Bregaglia) to then go down, by way of hairpin bends, to the village. The second alternative route, from Caccior, runs along a path which in some stretches is steep and goes towards an ample terrace where the famous village of Soglio (9) lies. From here there is a splendid view of Val Bondasca. One must not miss the midday sunlight shining on the Badile and Cengalo peaks as well as those of the Sciora group. From Soglio the asphalted road, that goes down towards Promontogno, must be followed for a brief stretch until arriving at a bend above the alpine huts of Plaza and where, on the right, a small road goes off down to the beautiful Caroggia waterfall. From here a tunnel marks the entrance to the suggestive Brentan chestnut woods, still today skilfully cultivated. Once passed the Italian border, one must carry on along the level path below the state road on till the Vigna bridge. From here the main itinerary returns up towards the state road and carries on to Villa di Chiavenna (3) going through the old hamlets of Ca' Scattoni (with the "Contrada di Specc" and the "Sas del Quartin"); also nearby are the group of "crotti" of Motta, St. Sebastian and Ponteggia (which has a restored winepress which dates back to seventeenth century). from which a beautiful terraced mule track, alongside Way of the Cross chapels, goes down near the dam. Turning left one must carry on until arriving at Giavera to then, once crossed the Mera river and followed up the small road, rejoin the main itinerary coming from Ponteggia. Once arrived and crossed the state road, one must continue on the asphalted road towards the Bregalone chestnut woods where, near the alpine huts of Vallate, a path on the left which goes down towards St. Croce must be taken and where the suggestive Rotonda church and St. Martin church can be found, this last one on the opposite side of the valley in the Aurogo hamlet. From Aurogo the path goes down towards the right with a good paved stretch ("Strecion") until meeting the small asphalted road which goes to Borgonuovo, near the Piuro excavation area. 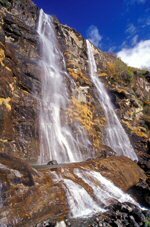 Once crossed the village in the direction of the imposing Acquafraggia Waterfalls (Cascate dell'Acquafraggia) one must then go up to St. Abbondio (Piuro Museum). The dry gravel river-bed of the Valledrana stream must be crossed to then go down to Prosto (2) (Vertemate Palace) and towards the ancient Ospitale and the Chiesa dell'Assunta, beyond the Mera river. 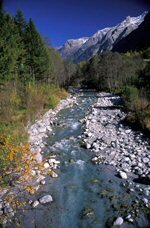 The route continues along the river and enters the suggestive park of "potholes" to then briefly reach the town of Chiavenna (1) near the Valchiavenna museum placed within the Comunità Montana and the Paradise park (Parco del Paradiso).